Buzz Aldrin walking on the surface of the moon. 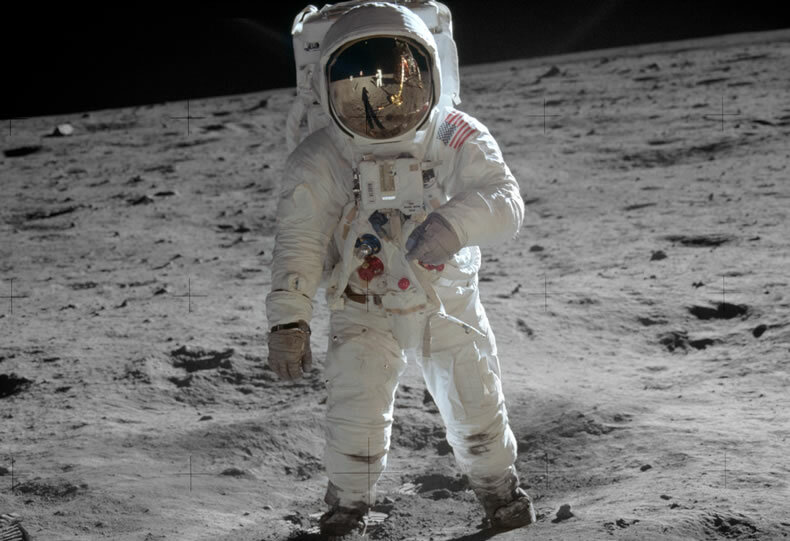 His helmet visor shows a reflection of the U.S. flag and the lunar lander, features that will be depicted in 2019 on U.S. Mint commemorative coins. On Thursday, Oct. 11, the United States Mint will unveil designs for the 2019 Apollo 11 50th Anniversary Commemorative Coins at the Smithsonian National Air and Space Museum in Washington, D.C. The ceremony is open to the public and will also be live-streamed from the museum and recorded for a later showing on NASA TV. 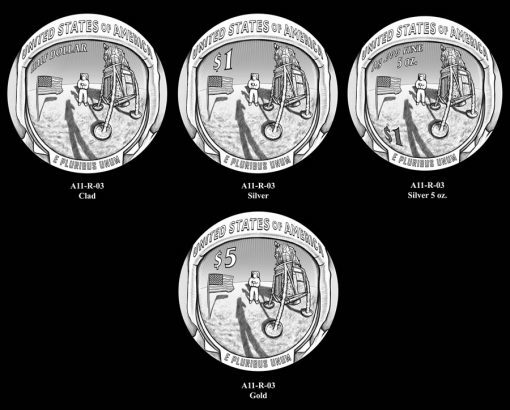 In recognition of the 50th anniversary of the first manned landing on the Moon, the U.S. Mint in 2019 will produce and sell $5 gold coins, silver dollars, clad half-dollars, and 5-ounce $1 silver coins with designs emblematic of the historic event. The commemorative coins will share obverse (heads) and reverse (tails) designs that are curved in shape like the 2014 National Baseball Hall of Fame Baseball Coins. Created by U.S. Mint artists, proposed reverse designs were reviewed in June 2017. 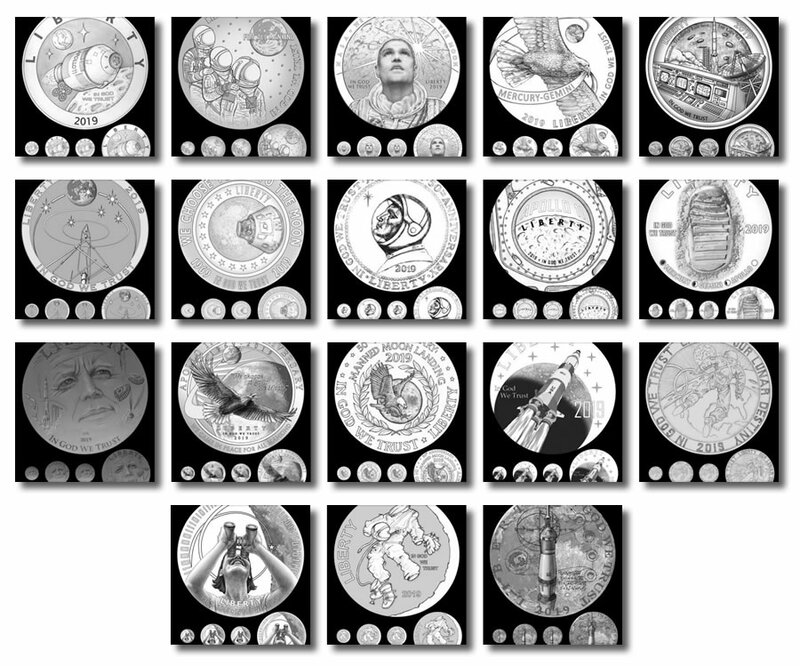 Each depicts a representation of the 1969 "Buzz Aldrin on the Moon" photograph as directed by the coin program’s authorizing law. Members of the CFA, CCAC and stakeholders from NASA preferred these sets of reverse designs for the 2019 Apollo 11 50th Anniversary Commemorative Coins. The four coins of the program will be curved, similar to the 2014 National Baseball Hall of Fame Baseball Coins, so that their reverses are convex to more closely resemble the visor of Buzz Aldrin’s helmet as seen in a photo taken on the moon in 1969. A public design competition set the stage for a final obverse selection. Proposed obverses are emblematic of the U.S. space program leading up to the first manned Moon landing and were reviewed in October 2017. The unveiling ceremony’s time and location details follow. The event will be live-streamed at: https://airandspace.si.edu/connect/air-and-space-live. Provided the commemorative coins turn a profit, a portion of their sales will support the National Air and Space Museum’s upcoming Destination Moon exhibition. The reverse design looks great – only a couple of the obverse designs look good however. Please no more images of Kennedy on the coins – prefer the Saturn V with orbits or the command module as a nod to Michael Collins who remained in orbit. Nothing like a cockroach on a coin, take Kennedy any day!!! Ugly coin! !